Seed of the purple owl’s foot clover with its honeycomb seadcoat shown in pink (Castilleja exserta subsp. latifolia) Image credit: Stuppy, Kesseler and Harley. Seeds are the plant equivalent of an armoured vehicle. They carry the offspring of plants out into the dangerous world and protect them until the time is right for them to grow into new plants. There is huge variety in the size and shapes of seeds, ranging from tiny orchid seeds weighing only 1-10 μg to the enormous seeds of the Seychelles nut that weigh 20 kg. The amazing variety in seeds is explored in the book Wonders of the Plant Kingdom: a Microcosm Revealed. The book is the result of a collaboration between two botanists—Wolfgang Stuppy and Madeline Harley—and the artist Rob Kesseler. 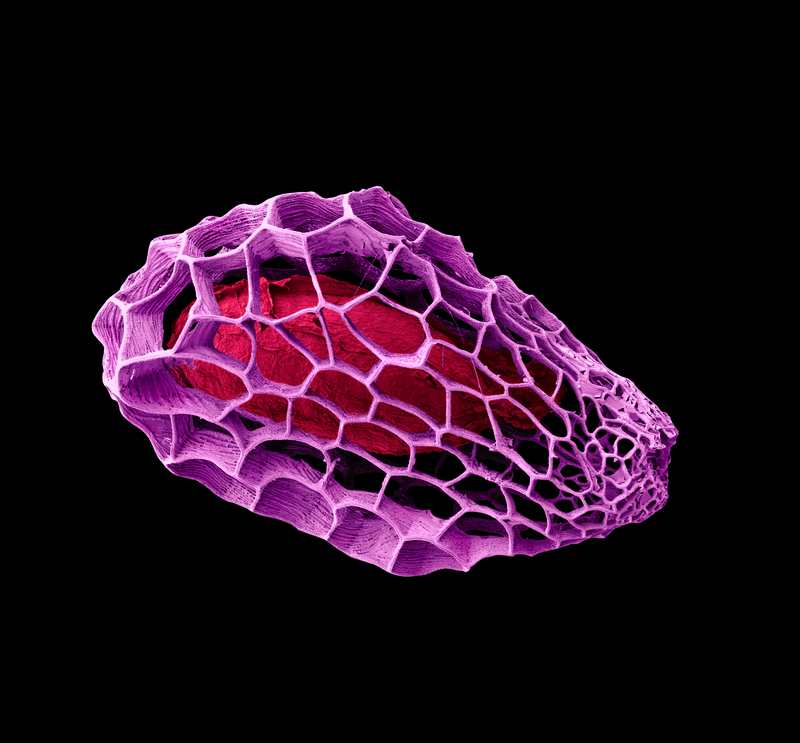 Most of the images in the book have been taken using an electron microscope, which provides a higher level of magnification than traditional light microscopy. These images were originally in black-and-white, but Kesseler has skillfully added colour to help bring them to life. One way seeds can be dispersed is by the wind, and I have fond childhood memories of playing with “helicopter” seeds from sycamore trees, which travel by spiraling through the air. However, there are other, less obvious adaptations to wind dispersal that can allow seeds to travel longer distances. Most plants that rely on the wind to disperse their seeds produce a large number of very small and lightweight seeds. Many have a honeycomb pattern on the surface, like those of the purple owl’s foot clover (see image above). The honeycomb is created by the programmed death of particular cells in the seed coat to leave only a framework of cells with strengthened walls. The honeycomb allows the seed to be very light but still maintain a strong seed coat. Also, it gives the seeds a larger surface area, which increases their air resistance and buoyancy. Other plants rely on animals to disperse their seeds. These interactions can be beneficial to both parties, for example, many plants encourage animals to eat their seeds by providing a tasty reward in the form of a fleshy fruit (e.g. berries or apples). The seeds pass through the animal’s digestive system unharmed and are deposited in a new location. Seed of the sun spurge (Euphorbia helioscopia) with the elaiosome shown in orange. Image credit: Stuppy, Kesseler and Harley. 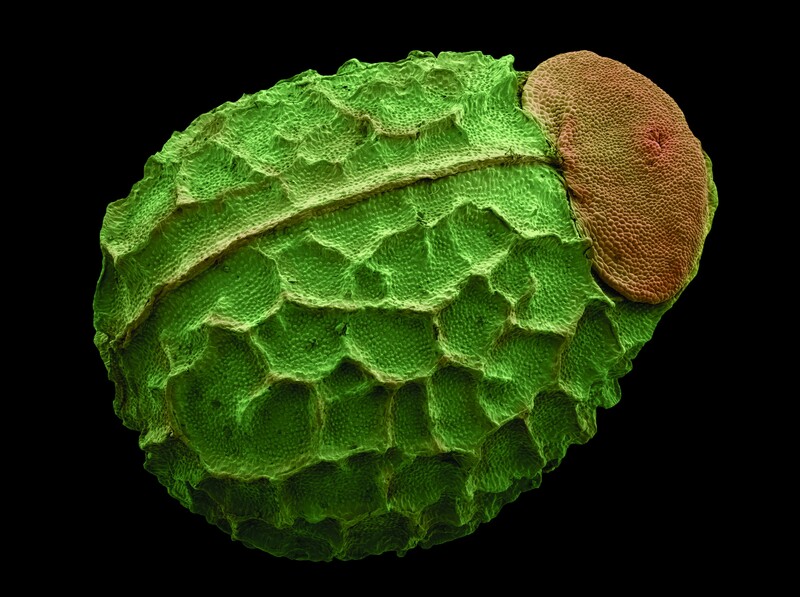 A more unusual way that plants reward animals is by producing seeds that have a small, yellowish-white oily nodule—known as an elaiosome—on the surface (see image above). The elaiosome is nutrient-rich and contains a chemical called ricinolic acid to attract ants, which carry the seeds to their nests. Then, the ants remove the elaiosomes to feed it to their larvae. The rest of the seed is left in the nest amongst the other waste produced by the colony, which gives the seed a head start in life by providing it with nutritious compost. Elaiosomes are common in plants that live in dry habitats—such as the sun spurge —where the actions of the ants protect the seeds from the harsh environment. Another strategy is to trick animals into carrying seeds away from the parent plant. Many seeds—including those of the American stickseed—are covered in hooked spines to attach the seed to plumage, fur and clothes (see image below). Seeds like this were the inspiration behind the development of Velcro® by the Swiss electrical engineer George de Mestral. American stickseed (Hackelia deflexa var. americana). Image credit: Stuppy, Kesseler and Harley. There are even more ways that seeds can be dispersed. Some seeds—including those of Entada gigas—are known as “sea beans” because they float in water and can be carried thousands of miles away by ocean currents. Other plants, including the lupins, have catapult-like fruits that send their seeds flying through the air. The book also showcases some of the incredible variety that exists in pollen and flowers. 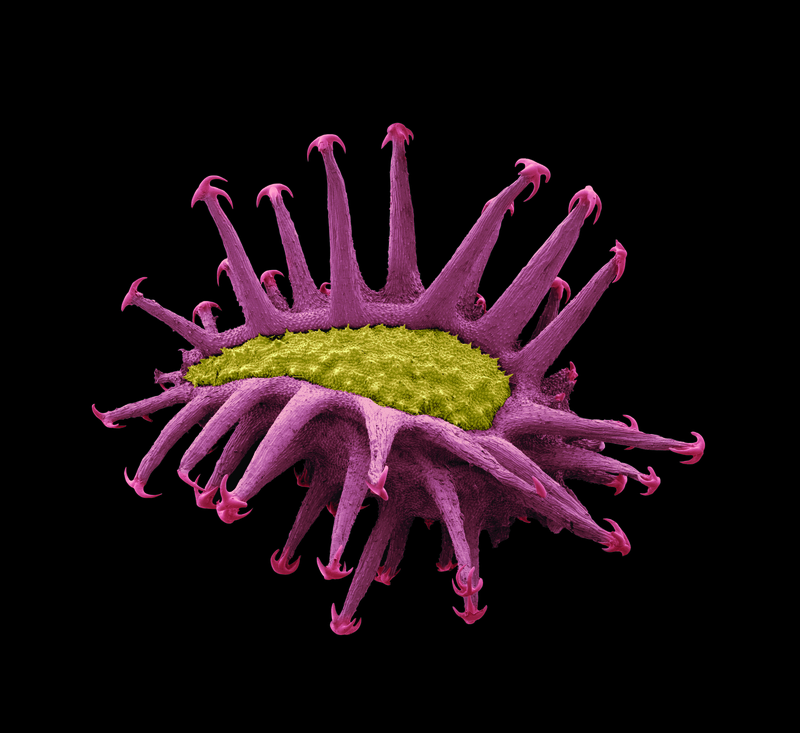 Pollen grains are much smaller than even the tiniest seeds at only 20-80 μm in size, but they can still be captured in stunning detail under the electron microscope. The big draw to the book is the fantastic images and I have spent many hours poring over them. I also really enjoyed reading the accompanying text, which helps to give the images a context and brings everything together to make a book that celebrates the beauty of the plan t world. Stuppy W., Kesseler R. and Harley, M. (2014) Wonders of the plant kingdom: A microcosm revealed. Papadakis.